For four years, David Kennedy walked across the campus of Grinnell College as both a student of history and a photographer. He approached the campus as his subject from his background as a nature photographer and his interest in the lines and forms of the structures around him. As David walked across the stage to graduate in May 2006, the first copies of his book were being unloaded on the West coast. 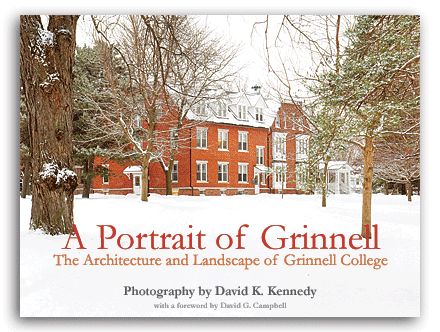 A 108-page 12×9 inch hard-bound and full-color coffee table book with a foreword by professor of biology and author David G. Campbell, A Portrait of Grinnell: The Architecture and Landscape of Grinnell College is now in its second printing! You’ll find it on the shelves of the Grinnell College Bookstore and Saints Rest Coffee House in Grinnell. You may also order signed copies directly from Light’s Edge Studios! Additionally, any of the 82 plates from A Portrait of Grinnell may be purchased as signed prints. David personally prints and signs each image using fine papers and archival inks.